This is the Pinocchio short story. 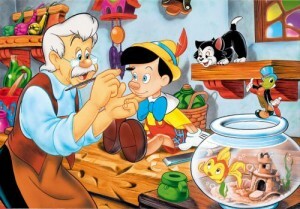 Long ago, an old carpenter named Gepetto carved a puppet in the shape of a boy and named it Pinocchio. He wished for the boy to be a real one. A fairy heard his words and fulfilled his wish. She added life to the puppet. You may also like to read, Robin Hood Short Story. But she wanted that if he was to be a real boy, he must always be a good boy. Gepetto loved him dearly, but Pinocchio was quite naughty and rarely spoke the truth. As soon as he lied, his wooden nose would grow long. He always promised to be a good boy from the next time. But he soon forgot his word and left the school with his friends to join a circus. Now, he began to miss Gepetto. One day, he heard that his father had been swallowed up by a huge whale. He immediately went to find the whale. The whale swallowed him as well. Inside the whale’s belly, Pinocchio and Gepetto were so happy to see each other. They made a plan to get out and began tickling the whale’s stomach. As soon as the whale opened his mouth and sneezed, Pinocchio and Gepetto slipped out. They reached home safely. The fairy was pleased with Pinocchio’s bravery and she turned him into a real fleshed and blood boy. From that day, he was a very good boy and never missed school. The father and son lived happily ever after. Also read, Peter Pan Story. Shreya Sharma is the Co-Founder and Creative Head of Bedtimeshortstories.com. She loves to share her passion for Writing and Kids with the world in the form of short stories, poems and more.